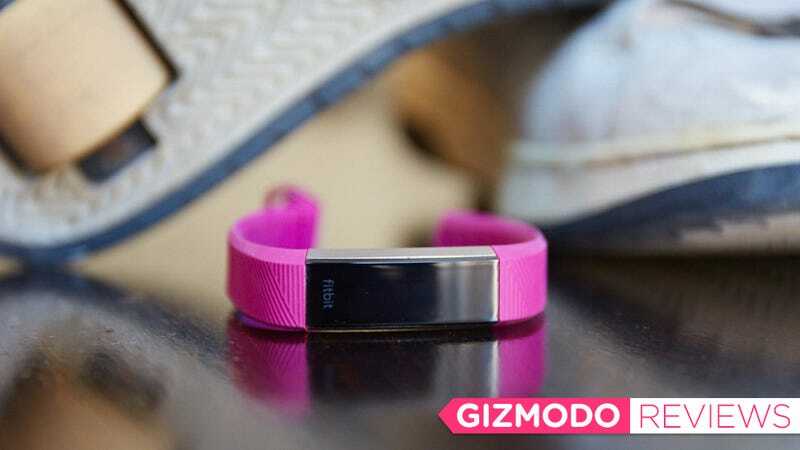 Let’s face it, the world of fitness trackers has plateaued. Most people who want a fitness tracker already have one, and more than a few of us have old trackers shoved away in a drawer, useless because the charging cable mysteriously disappeared, or because the company who made it decided it didn’t care anymore and killed the software (RIP Nike FuelBand). For people that really like fitness trackers, it’s been difficult to find one that is the right blend of features, functionality, and aesthetics. Last year, Fitbit released the Fitbit Charge 2, and I called it “the best fitness tracker, period.” In terms of functionality and features, I still think this is the case, it’s got GPS built in, and altimeter for tracking climbing distances. But the Fitbit Charge 2 is still bulkier than some people might like. That’s why I was excited to see the new Fitbit Alta HR, another fitness tracker with a heart rate monitor, that actually looks good on your wrist. For me, size of a fitness tracker is a big deal. I have tiny, tiny wrists (“child-like” is a phrase a former colleague used), and as much as I like the Fitbit Charge 2, it’s a little bulkier than I prefer for a fitness tracker—and I don’t need to know how many stairs I climbed or track myself via GPS. The smallest Fitbit, the Fitbit Flex 2, looks great, but its lack of a screen makes it less useful, at least for me. The Fitbit Alta HR is kind of the perfect middle ground. It has the stuff I actually want in a tracker—continuous heart rate monitoring features, and the ability to get calls, text, and calendar notifications on your wrist—but in a much smaller and more attractive wrist band. The Fitbit Alta HR looks just like last year’s Fitbit Alta. This is a good thing. The Alta was great because it doesn’t treat fashion as an afterthought. The only real physical difference between the Alta and Alta HR is the new heart rate sensor on the bottom of the device and replaceable straps that are easier to replace. The straps slide off and on the Alta HR. On last year’s Alta they had a tendency to be stubborn when you tried to replace them. The battery life on the Fitbit Alta HR is touted as lasting seven days, which is a day longer than what we got on the original Fitbit Alta. Yet in my tests, I still found myself charging most often at the six day mark. As for the heart rate sensor, it’s the same we saw in the Charge 2 (which is the same that was used in the Fitbit Charge HR and the Fitbit Blaze). There have been some conflicting reports about the accuracy of that sensor, but in my own tests, the Alta HR’s readings have been exactly the same as those measured by the Apple Watch on my opposite wrist. It might not be medically precise, but it’s accurate enough for most of us. The small OLED display is black and white and and adequately serves up the information that matters, like total steps walked, heart rate, resting heart rate, distance traveled, calories burned, minutes active, and the time. Like the Fitibt Alta and the Charge 2, the Alta HR can also receive notifications for text messages, phone calls, and calendar events. Make no mistake, the Alta HR will not replace a smartwatch, there are zero apps on the tracker itself, but if you just wanted notifications about texts and appointments, it’s a nice addition. As with last year’s model, the screen can be a little slow to respond. I didn’t have any problems flicking my wrist and getting the display to turn on, or cycling through the screens with a tap, but the device’s response time is definitely on the slow side compared to other gadgets. Alongside the Alta HR, Fitbit is also releasing a new software feature called Sleep Stages. Fitbit already tracked sleep, but the new software offers more insight into how you sleep by breaking down a night of rest into different phases. Lots of other companies offer sleep tracking software, but this is the first product I’ve seen that actually makes it easy to understand what’s going on over the course of a night. The Sleep Stages dashboard granularity shows what type of sleep takes place over a given night, and how long that type of sleep lasts. Those categories include, awake, REM sleep, light sleep, and deep sleep. I liked knowing just how poorly I sleep (I wake up frequently for brief spurts), how much time I spend in REM sleep, and how little time (relatively speaking) I spend in deep sleep. Just a few days of data reveals certain (maybe obvious) patterns: I wake up at 6:30 every morning, even if I don’t wheel myself out of bed until 7:45. I’m not sure if knowing that information can help me make better choices, but it’s certainly interesting data to know. This new software feature is also available on the Fitbit Charge 2 and the Fitbit Blaze. Looking at the size, aesthetics, battery life, and the new heart rate monitor, the Fitbit Alta HR is a great fitness tracker for the average person. And at $150, it’s a reasonable upgrade, especially for anyone who has an older Fitbit and is looking to add heart rate monitoring into their mix. I’m not sure if the fitness tracker fad will ever rebound—Fitbit itself laid off six percent of its staff in January—but for those that do care about tracking activities, heart rate, and sleep, the Alta HR is a real winner. The Alta HR has most of the features of the Fitbit Charge 2, but not all. If you’re looking for smartphone-assisted GPS, “Relax” mode, or VO2 Max levels, stick with the Charge 2. The Alta HR doesn’t have an altimeter, which means it can’t be used for counting flights of stairs climbed. Again, if that’s on your “must” list, look the the Charge 2. Fitness trackers are basically commodities at this point which makes software a big determining feature; Fitbit’s software is some of the best out there. Unlike the Flex 2, this is not waterproof. Still, I totally showered with the Alta HR and had absolutely no problems. The Sleep Stages stuff is awesome for nerds who love to track their body stats. It uses heart rate monitoring for its insights and it’s fascinating to see just how many times I wake up in the middle of the night.